I am done with my mooncake making. Later this week will be making jelly mooncakes for some of my aunties. Here is a box of baked mooncakes with less sweet white lotus paste for my parents-in-law. 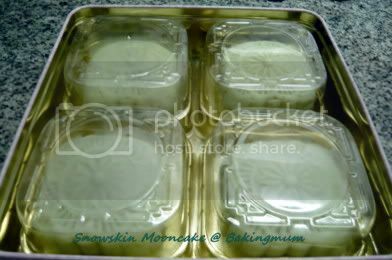 The box of snowskin mooncake is for hubby's colleague. Thanks Chow and Chatter and Wenn. 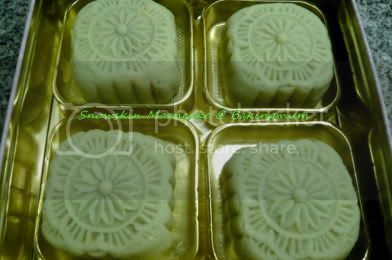 Anonymous, the bing pi mooncake has added wheat starch in the recipe and after steaming, wheat starch tends to turn hard quite easily. The skin is not smooth either because you oversteam or you have not knead enough, ie not kneading until the shortening has incorporate into the dough. Actually this is also my first time trying out this bi ping mooncake recipe so I am just guessing what the reasons might be for you. 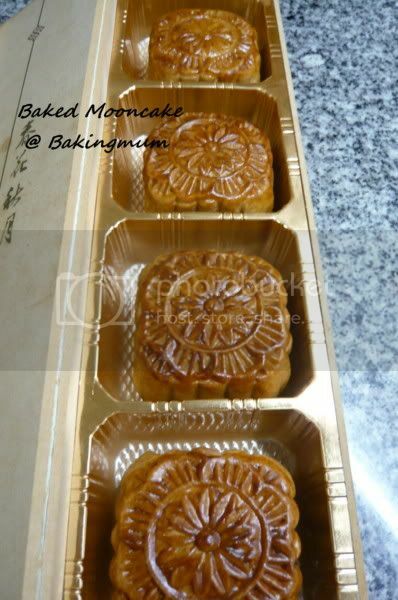 Wah, your baked mooncake has a very even golden brown colour, looks very professional. For the normal bing pi mooncake, you cannot knead the dough too long. It will become hard and rough and difficult to wrap. If you find it too oily, you can cut down on the shortening use.